Boxes full of memories. When I was 8 years old, my dad started building my family’s dream house, right on the edge of a forest near the east coast of Jutland. As he was travelling a lot for work and just in general worked a lot, this passion project of his came to take 3 years and involve the entire family – my brother and I helped assemble the wooden floors, my uncles did the tile work and bricklaying, my grandparents oiled the roof beams, my mum kept it all nice and neat and together throughout that adventurous time. Eventually we moved in, filing the house with beautiful furniture and art, and spent 10 happy years in the house. When my brother and I had both left for university, though, and my dad was still travelling extensively for work, my parents decided to sell our dream house. It was a tough and tearful decision, but it made sense. They split all of their beautiful furniture between my brother and me, and my share has been in storage along with all of my personal stuff for the 8 years I’ve lived outside Denmark. In those 8 years, at least until moving to Singapore, I’ve sort of repressed the desire to have a beautiful home: other things, such as city life, work, friends, were more important. Well, I don’t know if they ever were — but I chose to prioritise living with sweet, close girlfriends in dingy houses in cool areas of East London and spending as little time at home as possible, in fact redefining the meaning of ‘home’ — this is when home became where I was, physically and mentally, more than a fixed space. Moving to Singapore, and, more specifically, moving in with Sanoop, finally allowed me to reconcile some of these things: we were able to afford and happy to design a beautiful, homey space together. For the first time in years, I felt a bit settled, even if our furniture was just from IKEA. We had plants and paintings. We lived there indefinitely, and very happily so. Yet, somewhere I did know that we probably wouldn’t stay there forever — and sure enough, now we live in London. We probably won’t stay here forever, either, haha, but at least it feels permanent enough for me to finally come back to the beginning of this story and decide to pull my Danish possessions out of storage. Along with a few items we’ve bought together, such as our bed, my childhood home interior will now help shape our new home. Something I have secretly been dreaming of for years, haha. On Tuesday morning, it all arrives onboard a truck. The truckdriver and his sweet girlfriend, who joined him on the long drive through Germany and France, help me carry everything upstairs, the most significantly difficult part being my circa 18 moving boxes stuffed full of books and beautiful tall wooden bookcases. We have to slowly edge the tall, heavy things through the doorway to avoid breaking either of those parts. We run up and down the stairs a million times, and rather than getting exhausted, I feel adrenaline rising with every run — I can’t WAIT to get home from work tonight and unpack! First, I buy the movers breakfast at Biggie Best and go to work. Then in the evening, and all of the following evenings, I hurry straight home to unpack all the material memories of my childhood and youth. Special treasures include my mum’s romantic white rose-patterned porcelain, Christmas ornaments, beautiful glass PH lamps, a slew of wishbone chairs, the small mark in the cherry tree dining table that came about when my dad stamped one or the other part of his cutlery into the table during dinner in probably the only ever burst of anger he ever directed at me, the reason for which we’ve long forgotten, hehe, large collections of drawing material, and an entire box stacked full of my diaries from age 9-18. Reading a few pages in a few of those is the sweetest thing I’ve done in a long time. At first I feel bad “wasting” time reading something so indulgent when there are endless work-related decks and reports I could and should focus on reading, or what about the news, or this or that important article that someone sent me, or the stack of highbrow novels on my bedside chair that just keeps on growing … But then I come to my senses and realise: if now, the week that I unpack this stuff after having lived without it and paid a lot of money for its perseverance for almost a decade, is not the time to read through the words that a younger version of me wrote down to no audience at all… then when? I remember feeling afraid that an older me would find the words utterly silly and entitled, but what I don’t remember is how incredibly dedicated a journaler I must have been: pages and pages of meticulous records; I fall in love with myself in a way I’ve never done before: to think that a girl of 9, 10, 12, 14 could write this engagingly and teach this older me so much about myself and life… I laugh out loud at the adorable, swift, pensive, funny mind I had two decades ago, sending screenshots of particularly sweet observations to my family… it feels like a different person, yet certain things do come back to me, such an interesting trove to have… everyday actions, events, interactions with my brother, parents, childhood friends, extended family. There are also other pieces of beautiful, valuable furniture, so much good kitchenware, beautiful clothes that is still in perfect condition and which still fits perfectly, a painting of a buck that my brother made for me and Sanoop for Christmas. Last but not least: my thousands of books, such a big part of what shaped me, and continues to shape me. It’s hard work – carrying, organising, clearing up, running washes, cleaning. But fun.. and a good distraction from missing Sanoop – I’m going to make sure all of this looks tidy and nice for when he gets here. One of the most important aspects of getting all of this stuff transported over was that it fit well into our new home — according to Sanoop as well as me. When we looked through it all at the storage space at Christmas, I told him to REALLY, PLEASE, be honest about what he wanted and, more importantly, definitely didn’t want: it’s his home as much as mine, and as sweet as it is to me to have nice, fun, remarkable childhood memories immortalised in beautiful Danish design, it’s of so much more importance that this home is shaped by us. My parents couldn’t keep our old house just as a museum for us — and we are not living in a museum now either. Except, maybe, don’t be totally honest when it comes to the books, haha. I know he regarded the piles of paper with a bit of panic, thinking about the amounts of dust they might entail and how they’d mess with our minimalist style. My books are just one thing that I have a special soft spot for. So, as much as I do miss him, I am very happy that I’ve got these days to make everything look nice and neat. I vacuum and dust all of the books, even though I don’t actually really think they need it, and colour code the ones I put in the built-in bookcases in the lounge and organise all of the others by author, era, field or otherwise in the tall bookcases in the yoga studio / guest room / living room. Spend minutes just gazing at the dogeared The Famous Five series, Laura Ingalls Wilder’s collected works, Harry Potter (original and Danish translation), Anne of Green Gables, Emily of New Moon, the hundreds of books, fiction and non-fiction, on New York, tears of joy streaming down my cheeks. YES, home is where my heart is, and I don’t NEED any stuff, but … such a big part of my heart was shaped by these books. It feels inexplicably good to be reunited with them. To just be able to come home, make a cup of tea in the kitchen, and walk in here and see all of this. Singapore. As we don’t know how long it’s gonna take for Sanoop’s UK visa application to go through, we’ve decided that I come visit him this weekend. I’m just staying for five days, working out of the Singapore office on Monday-Wednesday next week and flying back for some meetings on Thursday. A little goes a long way, and when I take off on Friday morning, I feel just as elated as I’ve done all week, but for totally other reasons: so many things are coming together this week. Childhood memories distilled into beautiful things breathing life and function into our home, and us reuniting after a month apart, in the tropical island where we first met. When we left in November, we had no idea we’d be back here for so long / so soon respectively, Sanoop applying / waiting / hoping for a visa and I so fortunate to be able to come visit during this trying process. A place so familiar and pleasant, which will always be here. Excited for what lies ahead for us, and for adding Singapore as another compressed happiness place to our growing list of such places. I realise that the reason why it’s like that is because we make the most of our days everyday. So there’s a lot to miss and be grateful for. It’s not sad — because it’s not lost. Not only is it with me in memories, but we are also free to travel. 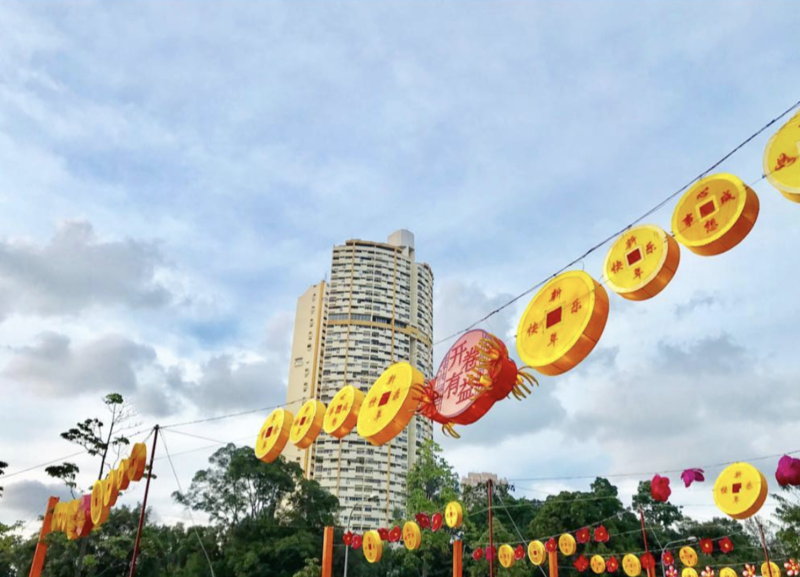 This time of year, Chinese New Year, is a lovely time to be in Singapore and experience all the good lunar energy, well-wishing and generosity. Saturday. No more automated passport lanes for me, but I do still feel “welcomed home” in familiar-smelling Changi. Sanoop is standing ready with open arms in Arrivals. I can’t remember the last time I was picked up from an airport, but we also haven’t seen each other for a whole month, and, also, this is as close as he gets to the air without a passport, haha. Butterflies in both of our stomachs as we run into the happiest reunion. We drive along the lush roads leading from the airport, and although I know it so well, it still hits me how incredibly stunning and alluring this entrance to the most beautiful country in the world is. Sanoop has already planneed the first stop from the airport: Homeground on the East Coast, one of our favourite cafes that doubles as a gallery exhibiting the whimsical, mesmerising seascapes of a local artist. Such intense flavourful, carefully crafted coffee and cheerful neighbourhood feel. Next stop, of course, Beriwell down the road, for super-sized açai smoothie bowls. Next, home to chill and read by the pool. We’re borrowing some friends’ luxury condo just off Emerald Hill, as they’re travelling in New Zealand. Very sweet of them to make us feel at home here. For the entire past month, Sanoop has been dividing his time between this flat and the guest room in another couple of friends’ flat, in Tiong Bahru, where I used to live when I first moved to Singapore, i.e. he’s been crashing in the very room that we co-inhabited a few weeks after meeting each other. Sweet. Just so incredibly great to know that he has had good places to stay without spending a fortune. As much as I love Tiong Bahru, I think it would have been too weird to stay there for these five days, so I’m very happy with the condo. Also, what a gift to have a tropical holiday thrown in so casually: this condo life is just unreal. Hehe. Were we insane to move away from here? No, we weren’t, but it’s still great to enjoy it fully now. When we grow hungry, we take an uber to Aloha Poke in Amoy Street. From here, Sanoop take me over to Ann Siang Hill, where he wants to show me something … my favourite clothing store, Our Second Nature, has opened a pop-up at the foot of the hill, in the Club Street corner! He urges me to try on what I like and buys me the most beautiful yellow dress. We then head over to Anthony the spice maker’s shop in Chinatown to stock up on chai ingredients, and stroll through my new favourite park, which I only just discovered the week before we moved, Pearls Hill Park, and then we share a tender coconut at Little Elephant in Tiong Bahru, have a couple’s massage at Nimble and Knead. After the treatment, when we stand in Eng Watt street and gaze up upon our cosy balcony, some of our plants still peeking out over the edge, I burst out crying. I hug him closely, he comforts me and says he reacted exactly the same way when he first came by, and I’m so grateful I’m not experiencing this on my own, but with him, with his arms around me, and the cry isn’t sad at all — it’s deeply grateful. Everything that we created in our first shared home is still with us. So, feel the tears, dry them off, and head over to Chinatown and look at all of the pig decorations!! Hehe. We edge our way through the crowds, enter the Chinatown complex and have a beer at Smith Street Taps, then an excellent, super romantic dinner at Le Bon Funk in Club Street, then a night cap at Employees Only. SLEEP. I love those CamSnoop days — no plans, no crazy exertion of energy, just a beautiful series of awesome events and insights experienced together in a natural flow. Sunday. Morning swim and five Tibetans by the pool in hot and hazy morning light. Sanoop’s homemade chai on the balcony. Heading straight back to Tiong Bahru — even if I don’t necessarily want to stay there just now, I still want to acknowledge the magnetic power it has on me, us. Coffee from 40 Hands — drink it sitting on one of those swinging benches in the little park by the Highline. The usual 9:30am class at Yoga Inc — led by a teacher who knows us. Afterwards, our usual breakfast and sections of the FT Weekend at Plain Vanilla. I cycle off to a 12 o’clock barre class, and all of the girls are there, and Jean brought a jar of her mum’s homemade pineapple tarts, and I have lunch at Ronin with the teacher after class. Sanoop picks me up and we walk through Fort Canning Park to Orchard, where we check out my friend Alicia’s clothes which are exhibited at Design Orchard. Home, nap, pool time, toasting in sauerkraut juice on the balcony. Meeting a mutual friend for dinner at Jai Thai in Bugis. Such a dreamy weekend — where both of us got to feel just how missed we are, hehe.